This week has been all about making decorations and gifts for a friend’s baby shower. The idea of baby showers doesn’t exist yet here in Sweden, so a few of us Americans are doing our part to start spreading the tradition within the borders. I volunteered to work on the decorations because I’ve been so gosh-darn inspired by all of you party decor DIYers out there – so I wanted to try my hand at it. I’ll take photos at the shower tomorrow and post them this weekend. Until then, here’s a little teaser. One of my gifts is a wall hanging for baby’s room. 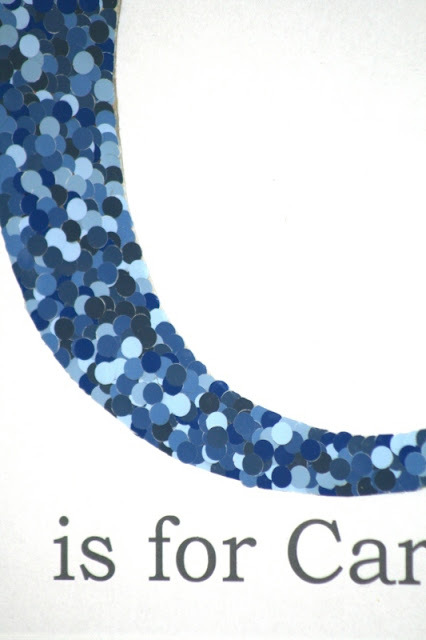 That’s HUNDREDS of hole-punched dots from paint chip cards…glued on one-by-one! These kinds of projects/gifts are a true labor of love because they take some much time and patience. And I could use more of both! I’m really pleased with how this decoration turned out. They are having a boy and naming him Carter, and he is their 3rd baby. So the ABC-123 idea worked perfectly. I scanned pages from a classic Swedish book given to newborns by their local city library. 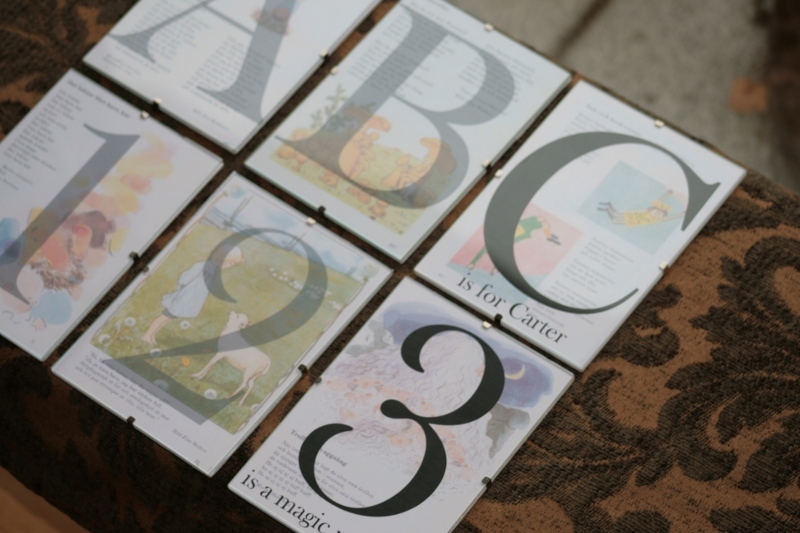 I reduced the opacity of the A-B and 1-2 pages, which gave the C and 3 a highlighted feel. 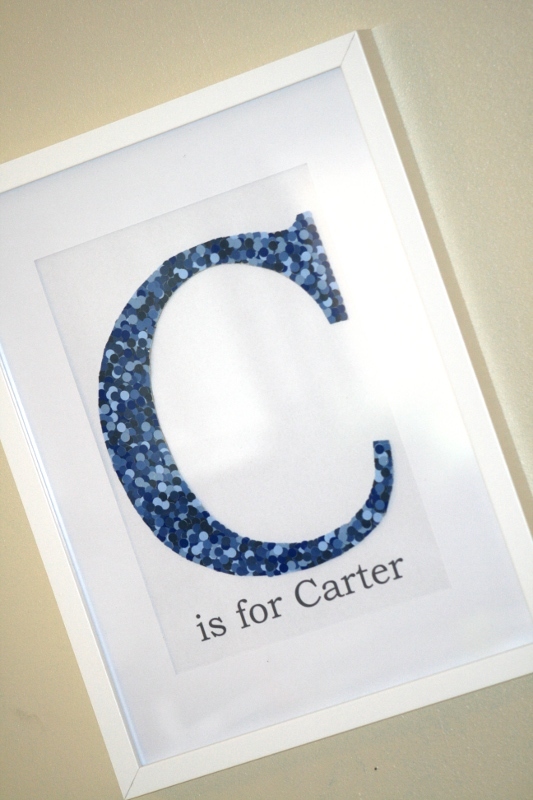 C is for Carter, and 3 is a magic number. Then I used some basic glass frames from IKEA that I had in my ‘one day I’ll use these’ stash. Today was the day! If you like looking at party decor DIY ideas, check back in later this weekend for the full party decor reveal. A unique baby shower theme will set your baby shower apart from the rest and can set the tone to ensure a fabulous time. The best baby shower ideas are often inspired by the mommy-to-be. Thanks a lot. AMAZING! and really? one by one! wow talk about patience!